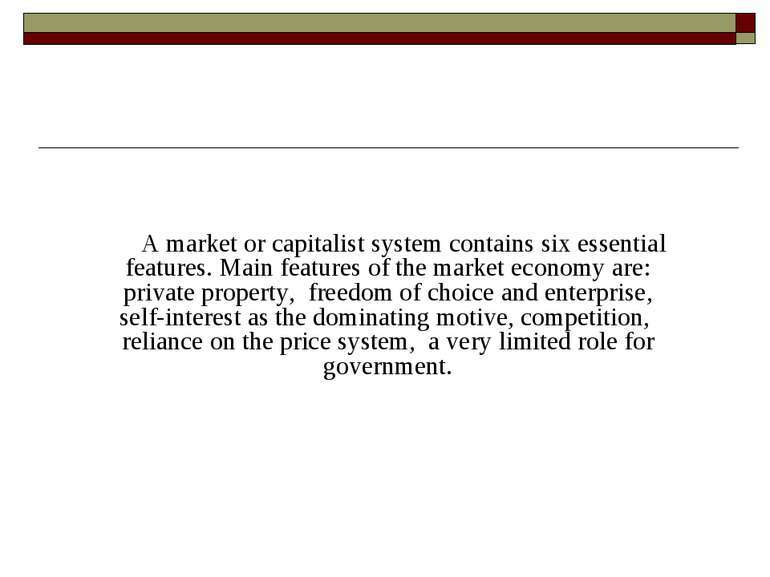 A market or capitalist system contains six essential features. 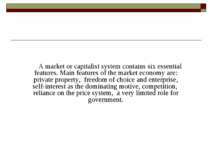 Main features of the market economy are: private property, freedom of choice and enterprise, self-interest as the dominating motive, competition, reliance on the price system, a very limited role for government. Man-made aids to production such as machines, factories, docks, oil refineries and road networks are known as capital. Private property not only confirms the right to own and dispose of real assets, it provides the owners of property with the right to income from that property in the form of rent, interest and profit. 1. 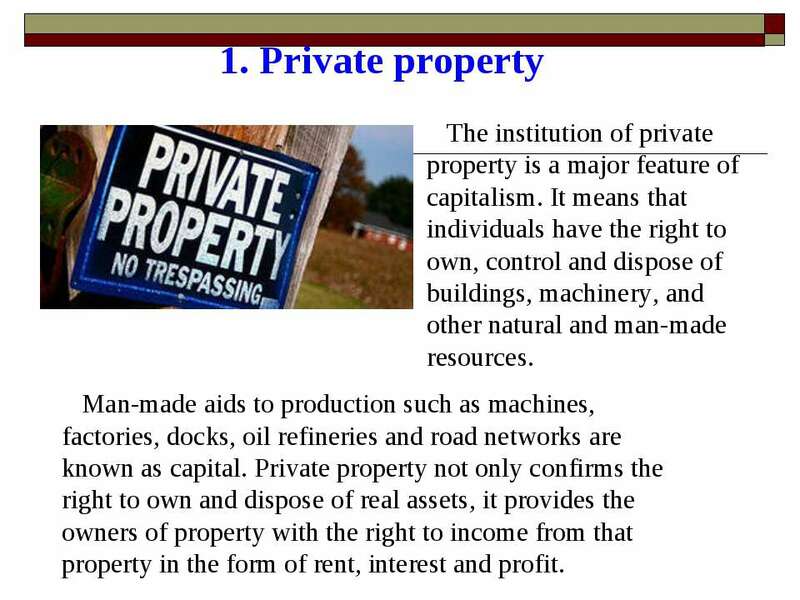 Private property The institution of private property is a major feature of capitalism. 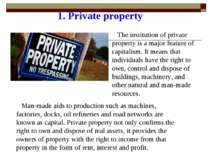 It means that individuals have the right to own, control and dispose of buildings, machinery, and other natural and man-made resources. 2. 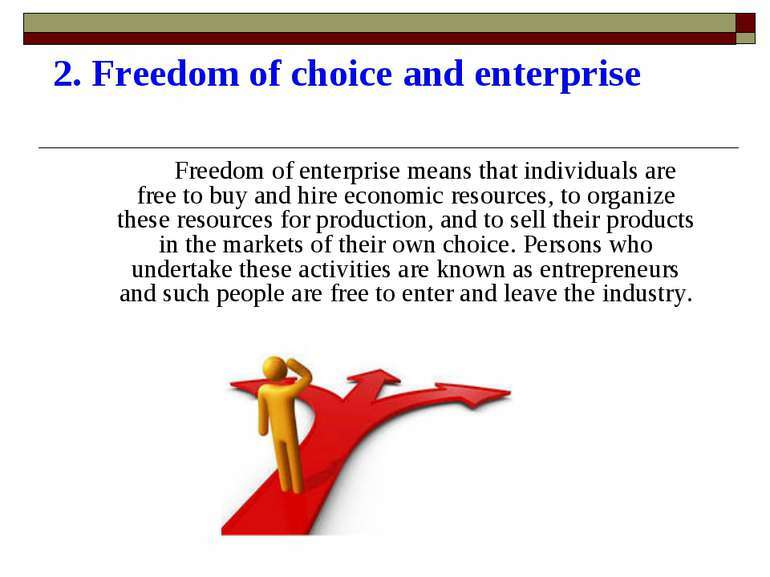 Freedom of choice and enterprise Freedom of enterprise means that individuals are free to buy and hire economic resources, to organize these resources for production, and to sell their products in the markets of their own choice. Persons who undertake these activities are known as entrepreneurs and such people are free to enter and leave the industry. 3. Self-interest Since capitalism is based on the principle that individuals should be free, to do as they wish, it is not surprising to find that the motive for economic activity is self-interest. Each unit in the economy attempts to do what is best for itself. 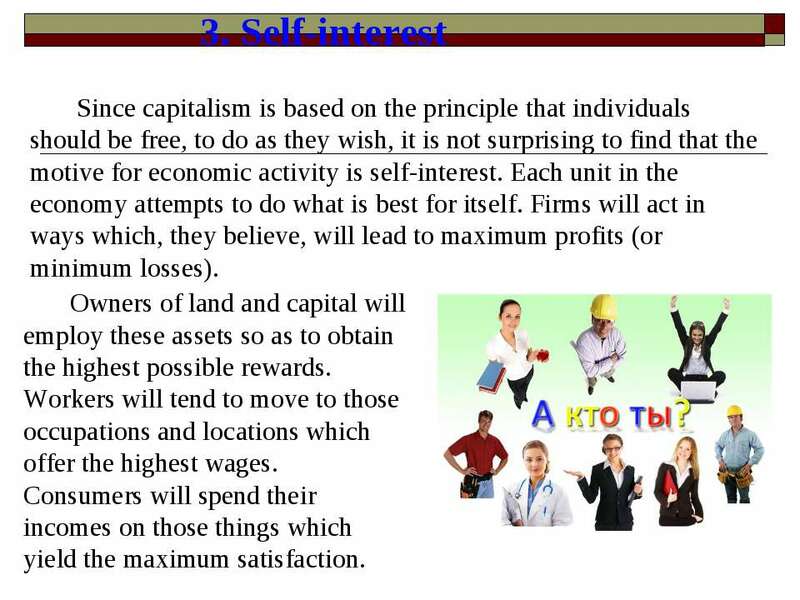 Firms will act in ways which, they believe, will lead to maximum profits (or minimum losses). Owners of land and capital will employ these assets so as to obtain the highest possible rewards. Workers will tend to move to those occupations and locations which offer the highest wages. Consumers will spend their incomes on those things which yield the maximum satisfaction. 4. 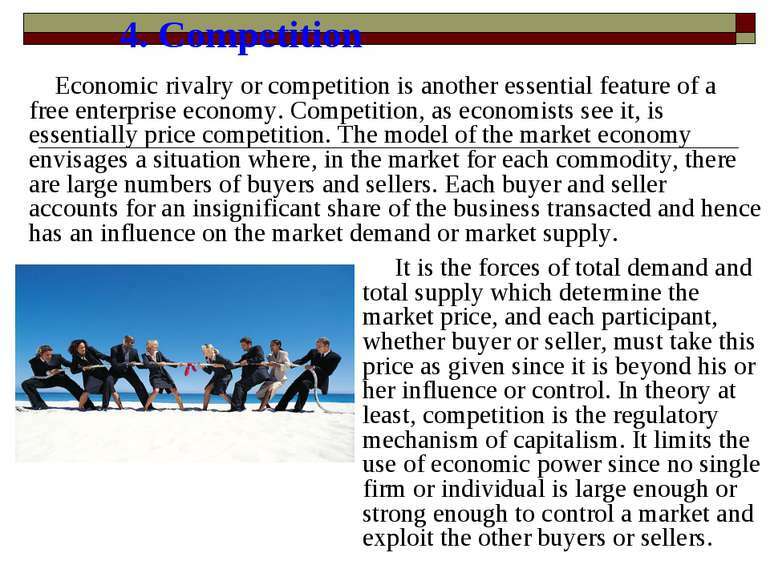 Competition Economic rivalry or competition is another essential feature of a free enterprise economy. Competition, as economists see it, is essentially price competition. 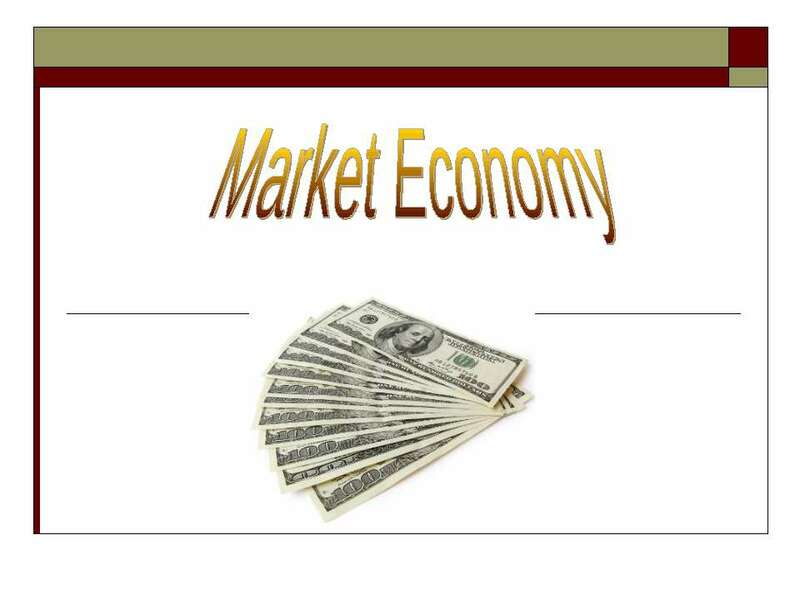 The model of the market economy envisages a situation where, in the market for each commodity, there are large numbers of buyers and sellers. Each buyer and seller accounts for an insignificant share of the business transacted and hence has an influence on the market demand or market supply. 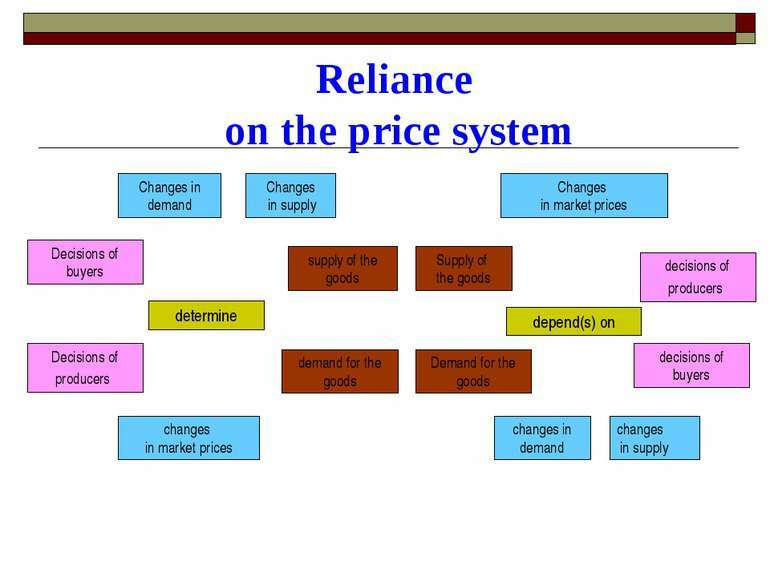 It is the forces of total demand and total supply which determine the market price, and each participant, whether buyer or seller, must take this price as given since it is beyond his or her influence or control. 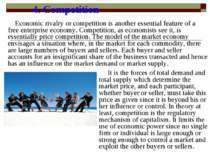 In theory at least, competition is the regulatory mechanism of capitalism. It limits the use of economic power since no single firm or individual is large enough or strong enough to control a market and exploit the other buyers or sellers. 5. Markets and Prices Perhaps the most basic feature of the market economy is the use of the price mechanism for allocating resources to various uses. 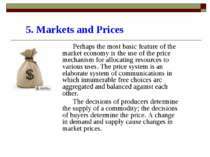 The price system is an elaborate system of communications in which innumerable free choices arc aggregated and balanced against each other. 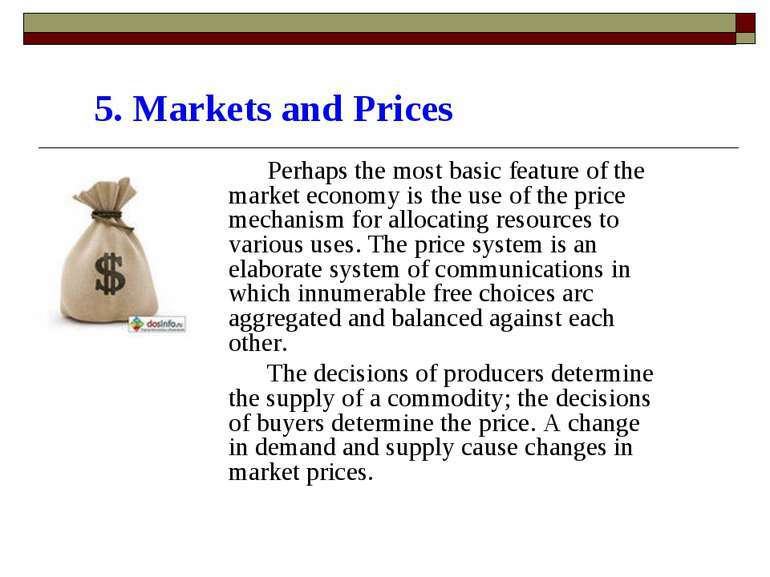 The decisions of producers determine the supply of a commodity; the decisions of buyers determine the price. 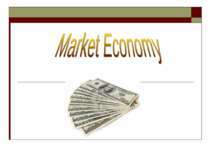 A change in demand and supply cause changes in market prices. 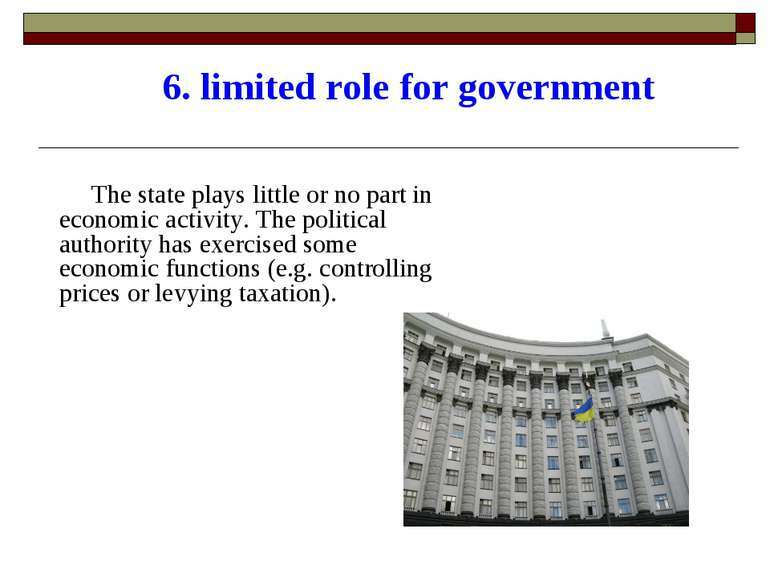 6. limited role for government The state plays little or no part in economic activity. 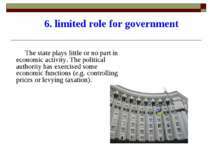 The political authority has exercised some economic functions (e.g. 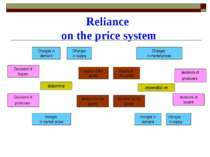 controlling prices or levying taxation). 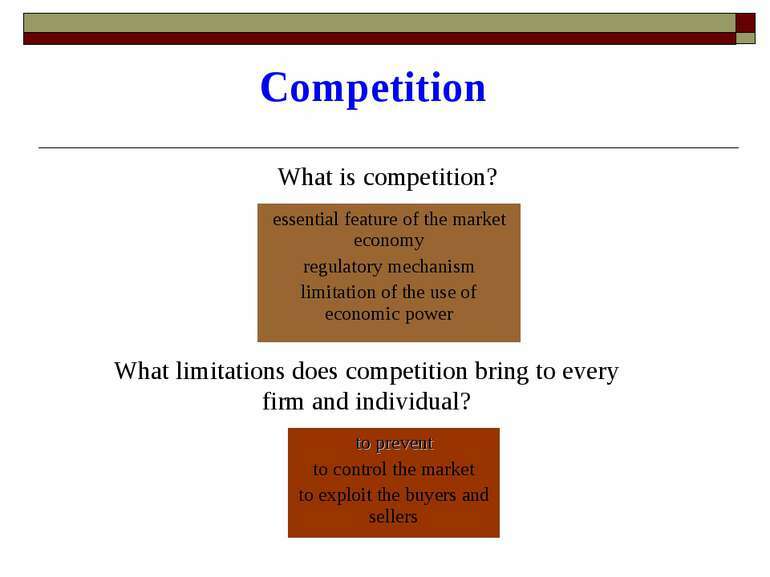 Competition What is competition? What limitations does competition bring to every firm and individual?